There are a lot of trade rumors going around Kevin Kouzmanoff today, and I’m a little freaked out. If you’re a reader of this blog, you know that Kouz is my absolute favorite player on the Padres and in the majors. There is no player in all of baseball that I like more than Kouz. 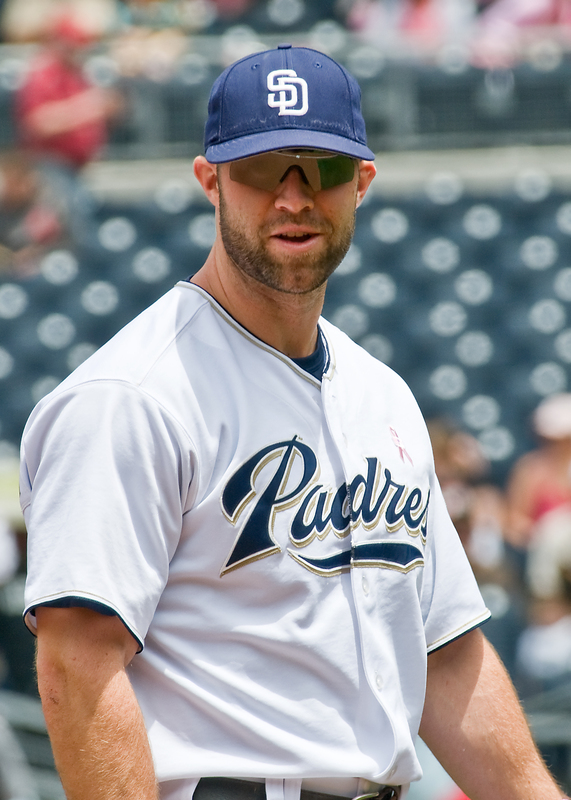 And I would pretty much go into major depression if the Padres traded him away. In the past year, we’ve lost two major players, Trevor Hoffman and Jake Peavy. And let me tell you, that grief that I went through would be nothing, absolutely nothing compared to the kind of grief that I would have if they trade Kouz. We don’t even want to go there. And so, I give you six reasons not to trade Kevin Kouzmanoff. 1. He’s a great third baseman. Say what you want about the merits of Ryan Zimmerman, but I believe that Kevin Kouzmanoff was right up there with him in the Gold Glove catergory. He had a .990 fielding percentage for goodness sakes! Sure, maybe his range isn’t the greatest, but he gets to many, many almost impossible balls. He’s only been in the majors for three years, but he’s improved on his defense drastically. He was not that great at all in his first year, but here he was, contending for a Gold Glove. I believe that he will only improve. Sure, we’ve got Chase Headley and lots of third basemen in the system, but why not stick with Kouz? He’s an amazing defending, and all of the fans love to watch him. 2. He’s a great hitter. Again, he may not be the best, but he’s still very good. He was second only to Adrian Gonzalez in RBIs and home runs (Adrian had 40, and Kouz had 18, but still). He’s exciting to watch, ’cause at any moment, you know that he could get the clutch hit that wins the game. Or he might get hit by pitch. We love him in here in San Diego. We love “Koozing” for him when he comes up to bat. There is no other player on the team that we do something like that for. And it started from the very beginning, too. Even through that horrible stretch that he had in the first few months that he was here, we were right behind him. He’s improved a lot. 3. He’s got a great attitude. Looking back at the stretch of time in early 2007, when he was batting something like .167, he kept a great attitude, kept getting in his work, kept pressing hard and staying in the game, and he didn’t give up. The press was all over him, the fans weren’t too happy, but Bud Black kept the faith in him and he didn’t disappoint. He finally got out of that funk and finished wonderfully. He was a quiet, laid-back kind of guy, and he didn’t seem to let the pressure get to him too badly. He really does have a great attitude about everything. I don’t think I’ve ever heard him complain to the press about anything, really. He’s got a great sense of humor, and he’s the kind of guy that I would want in my locker room as a role model to all the young guys around there. Like I said, he’s only been in the majors for three years, and he’s 28 years old, but he seems like a great role model. I’m proud to have him on this team. 4. He’s got a great work ethic. Kouz has a chronic back problem, which takes him out at least once a season. But he works very, very hard to make sure that the back doesn’t act up too much. He had worked very hard on his defense, which is probably why he’s gotten so much better over the years. I would want this kind of guy on my team, again, as an example to the younger guys. We just love this guy. He’s so much fun to watch, and to cheer for. Besides, he’s one of the three most popular guys left on the Padres. And he has the potential to get much, much better. I’m so happy that he’s here in San Diego. He’s great with the fans, doing tons of autograph sessions and things throughtout the season. He was born in Colorado, but he’s really a San Diego boy. I just love how he’s adapted to playing here, and how he interacts with the fans so well. There are quite a few treasured memories that I have of him and his kindness that I will never forget. He’s just to much fun to have here, and I really can’t think of a better fit for him than here in San Diego. We love you Koooooooooooooooooooooooooooooooooz!!! 6. I will never forgive the Padres if they do trade him. Naturally, I don’t think any of the Padres Nation will be happy if Kouz is traded, but this is really personal for me, because I love this player like crazy. It all started when he signed autographs for four girls before a game in September 2007. I totally fell in love with him right there and then. He was so nice in doing that for us, and it was one of the coolest things ever. He’s a wonderful player, and he’s very, very good looking as well. He’s really nice, and I just adore him. I would be devistated, and I mean devistated, if the Padres traded him away. I would not be happy with the Padres. No matter who we got in return. I would be very, very angry with the Padres, and it would not be pretty, peoples. Not at all. Sure, I’d still be a Padres fan, and I would recover eventually, but not without a lot of help. I would need a major support group to get through something that horrible (We miss you Tom!!). It would not be good. I would cry like crazy. And I really don’t want to see Chase at third. He’s great in left, let’s just leave him out there. So please, Jed Hoyer and the Padres front office, don’t cause us this pain. Keep the Kouz. We’re begging you. I love this guy, and I don’t know how much more of losing our most popular players I can take. Just keep him. Please, for the fans. I LOVE YOU KOUZ!!!! I was really sad when I heard that the Yankees made a deal that would have lost them Melky Cabrera, but after that, it turned out that it was a rumor. If Kouz leaves, I’m gonna faint. No joke. I can totally understand how you feel right now. HE MUST STAY!!! We can’t Kooooooooz anymore during games and I am gonna be very unhappy. UGH! This is so far off base it’s absurd. Your personal feelings toward a player should have no bearing on your opinion of whether or not he should be traded. Right now Kevin Kouzmanoff has value. He’s injury prone, incredibly inconsistent and a statue at third base. Chase Headley is younger, healthier and has the potential to be both a better defensive and offensive third baseman. Plus, you HAVE to play Kyle Blanks somewhere, it’s a must at this point. What are you going to do, trade Adrian to make a spot for Blanks? This is not a good baseball team right now. So moving the pieces not in your long term plans are what is best for the organization. And right now, that means trade Kouzmanoff and trade Heath Bell (who needs a closer on a 70 win team?). Besides, isn’t everyone a little tired of watching him ground into double plays and strike out with RISP? This is the most absurd blog entry I have ever read. Okay, maybe that’s an overreaction, but Kevin Kouzmanoff is an average third baseman. 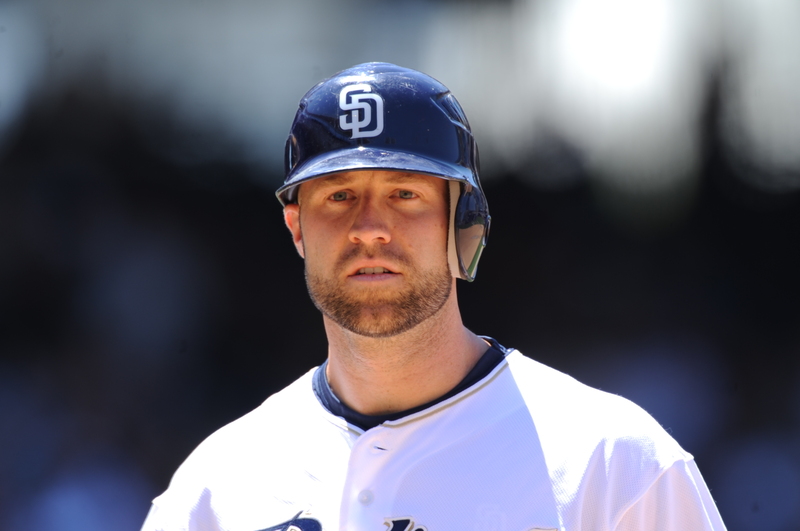 The Padres have a cheaper and better option at third base in Chase Headley. PLEASE trade Kevin Kouzmanoff, otherwise I will be an extremely pissed Padres fan. Okay, so I’m extremely biased. Excuse me for actually liking a star player on the Padres and wanting to keep him here!! Good riddance, russellanderson and dmilesai. Why criticize for what my friend has to say about her favorite player? It hurts SO much when a player you love leaves (Or about to. Whatever.) and how rude of you guys for writing negative comments without even thinking about her feelings. Sheesh. By the way Kaybee, can you come over to my blog and celebrate my blog’s birthday? 🙂 Please and thank you.